This project was initiated by the Department of Rural Roads with an objective to study the alternative and innovative mean of strengthening DOR�s bridges in addition to the typical bridge super structural strengthening methods universally done, i.e. sectional enlargement method, external post tensioning method, etc. due to the future allowable truck load increment. 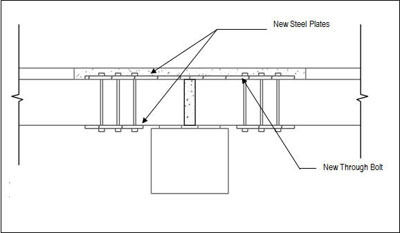 The scope of work included the studies of simply supported bridge load distributions, as well as load redistribution of bridges after modifying end-connectivity by using finite element structural computer programs. 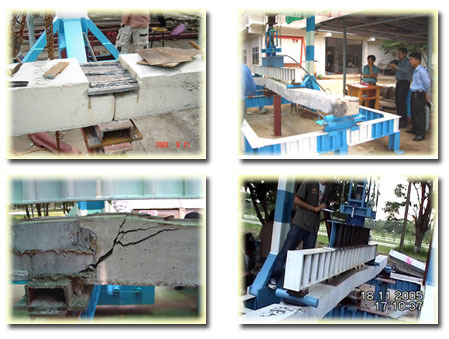 Several possible and practical strengthening details were suggested, and the efficiency of each detail was also verified and confirmed with the results from smaller-scaled laboratory testing conducted at the Department of Civil Engineering, Kasetsart University, Kampharng Saen Campus. The test results had confirmed the analysis results, and with further studies and tests will soon provide a very practical strengthening detail with satisfactory and predictable performance.